The Palestinian Centre for Human Rights (PCHR) calls upon the Attorney General to investigate the circumstances of the killing of Khaleda Tayseer Kawazbah (44) by members of the Palestinian police force in Sa'ir village, east of Hebron, and subsequent incidents in which four members of the same family were wounded, PCHR said in a press release Sunday. 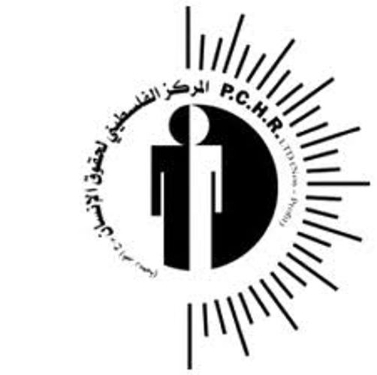 PCHR calls on the government in Ramallah to take the necessary measures to regulate the use of firearms by law enforcement officers and ensure their commitment to the Palestinian laws and international standards relevant to the use of firearms. According to investigations conducted by PCHR and testimonies of eyewitnesses, at approximately 20:30 on Wednesday, 08 May 2013, Nawwaf Mohammed Kawazbah (47) was with his wife Khaleda (47), their son Tha'er (25), and Tha'er's wife in a store in the centre of Sa'ir village, east of Hebron, in the south of the West Bank. 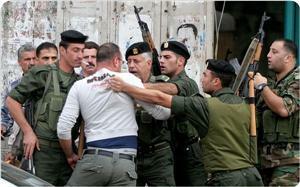 Four Palestinian policemen arrived at the store and ordered Nawwaf to go with them, but a quarrel erupted. A number of civilians gathered in the area, and a policeman fired in the air to disperse the crowd. Nawwaf and his family got into their white Mazda, which has an Israeli registration plate, and left the area. The family travelled to al-'Ein Square in the centre of the village, which is about 45 metres away from the store. Two policemen who were outside the police station opened fire at the vehicle's tyres and doors in an effort to force Nawwaf to stop. Nawwaf's wife, Khaleda, was wounded. The vehicle continued on to Sa'ir valley. After around fifteen minutes, Nawwaf returned to the police station at al-'Ein Square, fired at the building, and left. After some time, more members of the al-Kawazba family attacked the police station again, as it was reported that Khaleda had been killed. 4. Tamer Kawazba, who sustained a bullet wound in the hand. The wounded were transported to Hebron and al-Ahli governmental hospitals in Hebron to receive the necessary medical treatment. In a subsequent development, at approximately 21:00 on Friday, 10 May 2013, a number of civilians driving different vehicles arrived in the vicinity of Sa'ir police station and opened fire. In response, the police opened fire wounding Samer Kawazba in his leg. Police then arrested the wounded man. At approximately 22:00 on the same day, back-up units arrived and deployed in the village and around the police station. They erected a number of checkpoints at the northern and western entrances of the village. 3. Omar Mohammed al-Jahaleen (21), from al-Jahaleen area, in the east of Bethlehem, who was wounded by a bullet to the left shoulder and a bullet to the right hand. In his testimony to PCHR's fieldworker, al-Jahaleen stated that a Palestinian security officer had stopped the above-mentioned vehicle, spoken with the driver, was and then allowed the vehicle to pass. As soon as the vehicle had driven about 50 metres away, the Palestinian security officers opened fire at it, wounding the three persons. The wounded were transported to Hebron and al-Ahli governmental hospitals in Hebron to receive the necessary treatment. Medical sources described the wounds of al-Dayafeen and Abu Znaid as serious. Samer Kawazba remains in detention. 3. Stresses that law enforcement officers have no right to fire at civilians, unless exposed to real danger that threatens their lives or the lives of persons under their protection, and always in accordance with the international standards relative to the use of weapons. Clashes broke out anew between the PA security forces and Palestinian protesters in the vicinity of the police station in Sair town east of al-Khalil on Friday night and lasted till dawn Saturday leading to six casualties including a serious injury. A number of armed persons, in a private car, fired randomly towards police officers and PA security forces outside the police station in the village before fleeing the scene, local sources told PIC reporter. The PA police chased the fleeing attackers to Wadi Sair area and shot two of them and arrested the third, the sources added. According to the local sources, the attackers were relatives of Khaleda Taysir Koazibh who was shot dead by PA security forces while chasing her husband's car. Meanwhile, the so-called PA Preventive Service has detained four of Hamas supporters in al-Shuyoukh town, also in al-Khalil, including a liberated prisoner. The PA Preventive security arrested the liberated prisoner Khalil Yacob Halaiqa, who served six years in Israeli jails, and his elderly father in addition to two members of the same family. PA security forces have escalated recently political arrests against Hamas supporters in the West Bank in total violation of Cairo and Doha reconciliation agreements. PA security forces have escalated political arrests against Hamas supporters in the West Bank, where 9 of the movement's supporters were arrested while 2 others were summoned, in addition to extending the detention of 2 students. In Nablus, the PA preventive security arrested 2 Palestinians including a liberated prisoner who served more than 9 years in Israeli jails. The PA Intelligence also summoned a student at al-Najeh University. In Ramallah, the PA Intelligence service arrested a liberated prisoner, who spent 2 years in Israeli prisons, and a student at Birzeit University. In Qalqilya, the preventive security arrested 2 former prisoners at PA prisons, and extended the detention of 2 students for an additional 15 days. In Salfit, PA security forces arrested a student affiliated with the Islamic bloc at An-Najah National University, and detained a liberated prisoner in al-Khalil after summoning him. 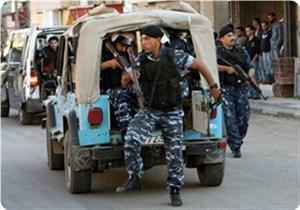 Preventive Security also detained 3 Palestinians from Sourif village northwest of Al-Khalil. Meanwhile, the artist and political prisoner Wajdi Aruri declared a hunger strike protesting his continued detention in PA jails since more than 4 years. Wajdi, 35, has declared his hunger strike since 3 days demanding his immediate release after serving three-quarters of his unjust sentence, the political prisoner's father stated. The liberated prisoner Aruri was arrested in 2009 by PA forces after serving nearly 5 years in Israeli jails. In a clear exchange of roles, the Israeli forces arrested on Thursday a young man wanted by PA security agencies. Fadi Mousa Ghneimat, 30, was arrested by Israeli forces after storming his house more than once. Ghneimat is a liberated prisoner who served 6 years in Israeli jails, in addition to being subjected to severe torture in PA jails. MP Samira Halaiqa called for an immediate end to PA political arrests against the Islamic bloc cadres and supporters in violation of the agreement signed between the Islamic bloc at universities in the West Bank and the PA security agencies. Halaiqa confirmed that hundreds of Islamic bloc members were arrested due to their political affiliation. She called on PA to put an end to the so-called revolving door policy as part of the security coordination between PA and Israeli security agencies. 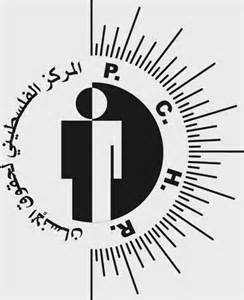 The Palestinian Centre for Human Rights (PCHR) strongly condemns the violent dispersal of a sit-in in solidarity with the Syrian people, held in Khan Younis in the south of the Gaza Strip, attacks against participants, and the detention of a number of participants by members of the Palestinian police. PCHR also condemns measures by the police to prevent journalists from doing their job; five journalists were detained by police, and one of them was beaten during the incident. PCHR demands that the Attorney General open an independent investigation into these attacks, hold the perpetrators accountable, and provide justice for the victims of the attacks. Additionally, PCHR demands that the government in Gaza take necessary measures to put an end to such violations, and to respect the civil liberties and fundamental freedoms of the citizens of the Gaza Strip, which are guaranteed by the constitution and under international human rights law. According to investigations conducted by PCHR and the testimonies of victims and eyewitnesses, at approximately 18:00 on Tuesday, 07 May 2013, around 50 civilians participated in a sit-in in solidarity with the Syrian people and in condemnation of the Israeli shelling of Syrian territory. The sit-in was held in al-Qal'a Square in the centre of Khan Younis and organised by the Arab Front for the Liberation of Palestine. Shortly after the sit-in began, two individuals dressed in civilian clothing arrived at the scene and ordered the participants to disperse. Shortly afterwards, members of a unit of Palestinian police began to violently disperse the crowd, beating some of the participants with gun butts and clubs. Police detained 5 of the participants and took them to the Office of the Prosecutor in Khan Younis City; they were released an hour after they were detained. During the same incident, members of Palestinian police prevented journalists, who were covering the sit-in, from carrying out their work and forced them to leave the scene. As the journalists were leaving the area, they were followed by members of police, who detained 5 of them and confiscated their equipment. One of the journalists was beaten, and his camera was destroyed. 5- Iyad al-Baba, photojournalist for the APA Media Company. 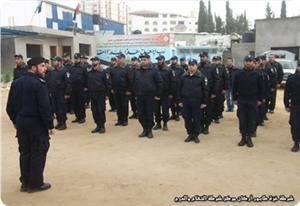 The Ministry of Interior Affairs published a press release on Tuesday evening that stated: ”The Ministry of Interior's Information Office apologizes for the actions of a number of members of the Palestinian police this evening, who used rough treatment against a number of journalists while covering an activity in Khan Younis governorate, in the south of the Gaza Strip. The Information Office has followed the situation from the beginning and addressed it immediately […] the Office continues to follow the events to ensure that the incident will not be repeated, that the perpetrators will be held accountable, and that the journalists will receive justice." 3- Attacks by the Palestinian police against civilians and the detention of participants in a peaceful public event without a court order constitutes a violation of the personal and public freedoms of civilians, according to Article 32 of the Palestinian Basic Law, and is considered a crime for which there is no statute of limitations to file a civil or criminal complaint. 2- Calls upon the government in the Gaza Strip to take necessary measures to put an end to such violations, to respect the civil liberties and fundamental freedoms of citizens of the Gaza Strip, as well as the freedom of the press, which are guaranteed by the constitutional and under international human rights law. 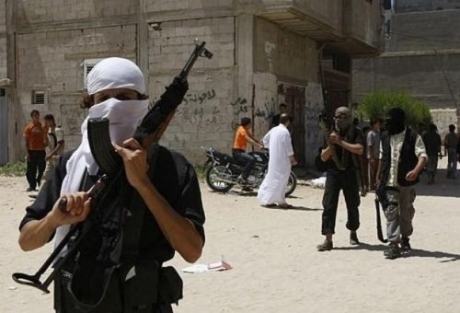 The committee said that incident took place Monday when Hamas fighters and security forces chased Salafi fighters in the Tuwam area, shot and wounded one of them before moving him to an unknown location. 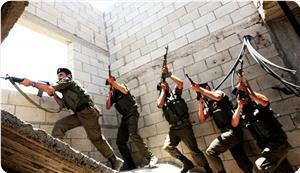 It added that fighters of the Al-Qassam Brigades, the armed wing of Hamas, have been deployed close to border areas, with the sole responsibility of preventing all armed groups from firing shells into Israel, and stated that the Interior Security Forces, running under the Ministry of Interior in Gaza, are coordinating their activities with the Al-Qassam Brigades. A few days ago, Qassam fighters reportedly attacked Abdullah Al-Khatoumi, a Salafi fighter from An-Nusseirat refugee camp, and arrested him after inflicting several fractures to various parts of his body, the Follow-up committee claimed. The journalist detainee Mohammed Awad, from Ramallah, has declared an open hunger strike since Saturday protesting his continued arrest by the PA preventive service despite a court ruling ordering his release. The detainee's family appealed to human rights and media institutions to intervene for his release. The Ramallah court on 17 April ordered the release Awad on bail, however it withdrew its decision under pressure from the PA preventive security. 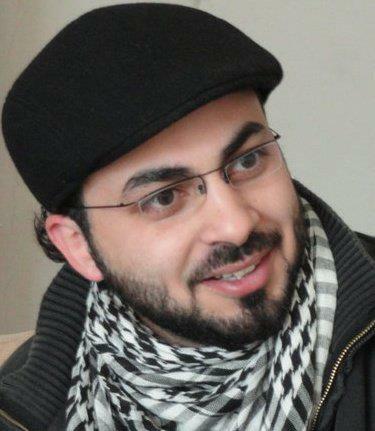 The journalist Mohamed Awad was detained more than once in PA prisons most recently in February 19. 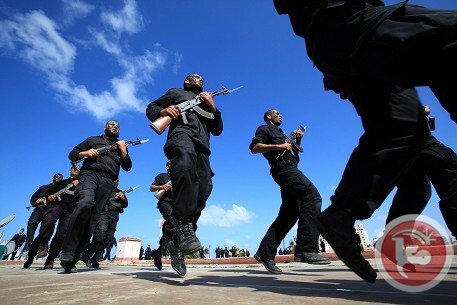 Hamas movement has revealed, in its report issued on Saturday, that PA security services have detained 38 of its supporters, while summoning 9 others during April. The report confirmed that 20 liberated prisoners, 3 university students, 2 journalists, a teacher and an imam were among the detainees. 12 Hamas supporters have been arrested in al-Khalil, while 10 others were detained in Nablus, 5 arrests were reported in Ramallah, 4 arrest cases took place in Tulkarem, while two other cases were in Tubas, in addition to two detainees in Jenin, and one detainee in Salfit. Meanwhile, PA Preventive security services renewed the detention of 4 detainees for 45 days in violation of a court ruling ordering their release, the prisoners' families confirmed. The preventive security services have continued to summon the liberated prisoner Bahjat Yamin on a daily basis since his release a week ago from PA prisons in which he was subjected to severe torture, in addition to summoning the former prisoner Hazza Amory, a student at Al-Najah University. The liberated prisoner Mohammed Janagerh's family has appealed for his release especially after receiving information of being tortured in Jericho prison. 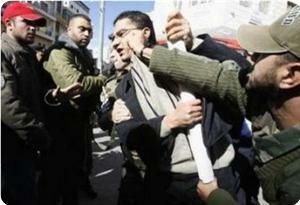 PA security apparatuses attacked and arrested on Saturday afternoon cadres in Hizb ut-Tahrir during a rally in Jenin. The Islamist group members have gathered in a mosque in the northern West Bank city and held a rally after noon prayers to protest the Arab League's recent public backing for land swaps with Israel as part of a peace agreement. Eyewitnesses said that the Authority apparatuses deployed dozens of their elements in Jenin and surrounded the mosque during noon prayer. Elements of the security forces attacked the worshipers, including the elderly people, and dispersed the rally. Seven Hizb ut-Tahrir affiliates were arrested by the PA security elements, while about 15 others were wounded during the attack, local sources said. Baher Saleh, member of the Information Office of Hizb ut-Tahrir party, condemned in press statement the procedure of the security services, stressing that it will not discourage the party, which is determined to escalate its activities. Hamas has arrested several Salafists, the Interior Ministry in Gaza said on Thursday, two days after Israel carried out an air strike on a militant in the enclave. 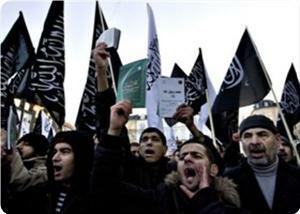 "The internal security apparatus has arrested fanatics calling themselves Salafists, for security and criminal reasons. There were no arrests made for ideological or political reasons," a ministry statement said. "Four of those arrested were taken in on suspicion of stealing rockets belonging to Hamas, and two others for causing an unspecified explosion that resulted in "human and material damage," it added, without giving a total number. The Mujahedeen Shura Council Salafist group, one of whose members was killed in the air strike on Gaza City on Tuesday, said the jihadists were being detained for ideological reasons. Salafists in Gaza -- who are considered more hardline than the Islamist Hamas -- have challenged the movement both over confrontations with Israel and the practice of Islamic rule, prompting it to crack down on their militant activities. The MSC implicitly denied stealing any rockets. Israel's air force targeted Haitham al-Mishal as he rode his motorcycle in western Gaza City on Tuesday, it said in a statement. Israel said Mishal was involved in an April 17 rocket attack launched from Egypt's Sinai Peninsula, adjoining Gaza, which struck the Israeli Red Sea resort of Eilat causing no casualties. The MSC has claimed a number of rocket attacks in the past few months, all except that of April 17 being launched from the Gaza Strip. Hizb al-Tahrir accused, during a press conference in Ramallah yesterday, the PA security services of torturing the party's members and handing them over to the occupation authorities. The party's Media Office confirmed that it will increase its activities throughout the West Bank regardless the PA restrictions. Baher Saleh, member of the Press Office, accused the PA security members in Tulkarem and Jenin of handing 25 of the party's members to the occupation after being subjected to severe torture. The party owns video tapes documenting the handing over operation, he emphasized, denouncing the PA security forces' repression policy in Tulkarem and Jenin. He stressed that their members are tried for fabricated charges. The PA security services have released 50 of the party's members on bail after holding and trying them for fabricated political charges, he explained. Palestinian Authority security forces arrested five Hamas members in the West Bank on Wednesday, the Islamist group said in a statement. 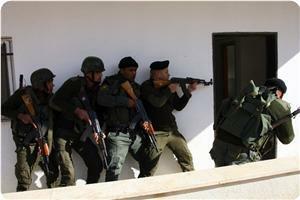 The Hamas affiliates were detained in Hebron, Ramallah and Qalqiliya, the statement said. Mohammed Ghannam, a detainee at the PA preventive security apparatus, lost his ability to talk after he was subjected to severe torture. Ghannam had been kidnapped on Saturday where he was subjected to severe torture by preventive security elements who beat him severely on his head led to concussion. Ghannam was transferred three times to hospital during his detention at the PA preventive security headquarters. Ahmed Ghanam, the detainee's brother, confirmed that Muhammad was severely tortured and beaten on the head where he lost his ability to talk, pointing out that the government hospital doctor in al-Khalil confirmed that he suffered a concussion because he was beaten on the head. 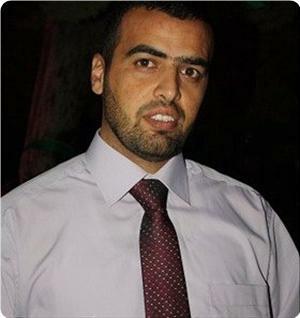 Mohammed Ghannam confirmed, in a letter written by himself to the PIC reporter during a visit accompanied with a number of Palestinian MPs, that he lost his ability to talk due to the severe torture. Ghannam’s family held the PA and its preventive security apparatuses responsible for the life of their son who was repeatedly kidnapped by those apparatuses, threatening to prosecute them. The detainee's daughter called on human rights institutions to reveal the PA crimes in its jails. For his part; Dr. Aziz Dweik, the PLC Speaker told to the PIC that this unforgivable crime should be raised should be investigated and perpetrators prosecuted. Dweik confirmed that such crimes undermine the efforts to achieve national reconciliation, stressing that the PA political arrest policy only serves the enemy. For his part, MP Mohammed Maher Badr, who visited the prisoner Ghannam in the governmental hospital in al-Khalil that the government Ghannam has fully lost his ability to talk. 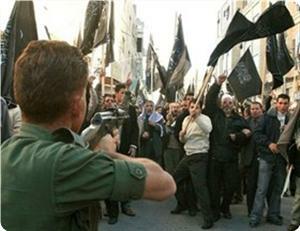 He condemned the PA brutal policy in dealing with Hamas supporters and cadres in the West Bank. Mohammed Ghannam, a former prisoner in Israeli and PA jails, is a father of 3 boys and 5 girls. The Palestinian authority security forces kidnapped four Palestinians affiliated with the Hamas Movement in the West Bank and transferred one of the political prisoners to hospital as a result of his exposure to torture. The PA intelligence agency kidnapped ex-detainee Mohamed Rabie, 21, from his home in the western farm village in Ramallah. Rabie is a student at Al-Quds open university and spent three years in an Israeli jails. In Nablus, the preventive security kidnapped Ahmed Samhan from his home in the city, while the PA intelligence kidnapped teacher Nidal Daglas from a school in Asira ash-Shamaliya town to the north of the city. Both of them were ex-detainees in Israeli jails. The preventive security also kidnapped a young man from Hamas named Marouf Abu Fara in Sourif town to the north of Al-Khalil city. In another incident, the family of political prisoner Mohamed Ghannam said the preventive security transferred him to Al-Khalil hospital after his exposure to severe torture at the hands of its interrogators. For its part, the family of ex-detainee Ismail Arouj, from Bethlehem, appealed to human rights groups to intervene to have their son released from a PA jail in Ramallah. It said that the preventive security kidnapped its son one day after his release from an Israeli jail more than one and a half month. In a new incident, the preventive security released on Sunday evening Khaldoun Madloum, a reporter working for Quds Press, after being detained for three days to interrogate him about his press activities. Palestinian Authority security apparatuses arrested on Saturday two sons of the Hamas leader Sheikh Jamal Abu al-Hija, detained in Israeli jails, after storming his house in the Jenin refugee camp in the northern West Bank. Sources from the camp said that the PA security arrested the brothers Asim and Imad Abu Hija sons Sheikh Jamal, but failed to arrest their brother Hamza. An atmosphere of tension and anger has prevailed in the camp during the raid, as the residents have gathered around the house of Abu Hija while angry youths threw stones at the security elements, forcing them to withdraw from the place, accompanied by the two detained brothers. 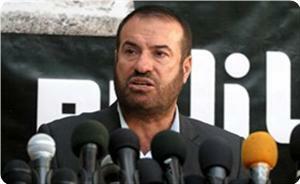 The Hamas leader's house had also been stormed and searched by the security apparatuses earlier this month. Sheikh Jamal Abu Hija has been held in Israeli jails since 2002, and is sentenced to nine life terms, on charges of his role in the Palestinian resistance, his affiliation with the Izz al-Din al-Qassam Brigades in Jenin, and his responsibility for a number of specific operations. Meanwhile, the Preventive Security Service arrested in al-Khalil, in the occupied West Bank, the liberated prisoner Mohammed Ghannam, aged 42. 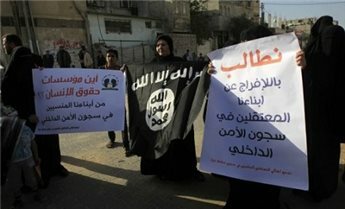 Relatives of Salafists arrested by Hamas protested in Gaza City on Sunday to demand their release. 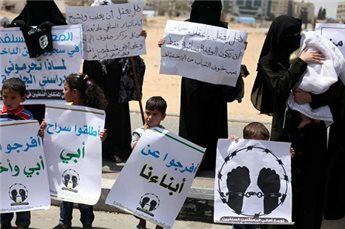 Families carried banners and shouted slogans to demand the release of their relatives, who they say have started hunger strike action to protest their detention without charge. 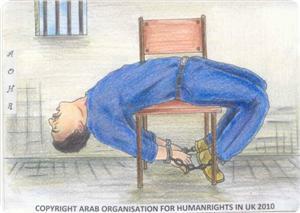 "My son has been held by internal security since the beginning of this month. Until this moment, we were not allowed to visit him," a father of one of the prisoners told Ma'an. The families said that they have not been informed as to why their relatives have been arrested. Um Muhammad told Ma'an that her son went missing for three days before she found out that Hamas security forces had arrested him. She does not know why her son has been detained, she added. Gaza police did not intervene in the protest, witnesses said. According to sources close to the Salafists, Hamas arrested several members of the movement following rocket attacks on Israel earlier in April. Hamas, which has ruled the Gaza Strip since 2007, has regularly cracked down on hardline Salafists in the territory, notably in 2009. PA security apparatuses in the West Bank arrested on Friday afternoon the correspondent of Quds Press agency in Ramallah journalist Khaldun Mazloum. Mazloum's wife said that a force of the Preventive Security men surrounded the house of her parents in law, in Janiya village near Ramallah, then arrested her husband. The elements of the preventive apparatus informed the Mazloum family that his arrest will not be long. She told Quds Press agency that Khaldun has been taken to the headquarters of the Preventive Security in Ramallah in the Beitunia district, and that they are making ​​contacts with some human rights official bodies to find out the reasons behind the detention. The journalist's wife has also demanded the journalists' union and all the bodies concerned with human rights and freedom of media to intervene with the Palestinian Authority in Ramallah in order to release her husband. 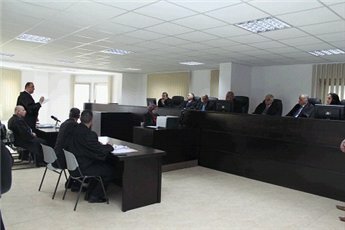 The Ramallah Magistrate Court Thursday remanded three employees of the Supreme Judicial Council held on charges of corruption for 15 days, according to the head of Council’s media center. Faris Sabaaneh told WAFA that the three employees, who were working in the financial department of the Supreme Judicial Council, were referred for investigation by the Council itself on suspicion of corruption. He said the corruption charges are still under investigation by the attorney general’s office and that the Supreme Council is still waiting for the results. Reports had said that the Anti-Corruption Authority was investigating a corruption case described as big in the Supreme Judicial Council. The forum of Palestinian journalists (FPJ) strongly denounced the Palestinian authority intelligence agency for kidnapping journalist Tareq Khamis from a hospital in Ramallah city. In a press release on Tuesday, the forum said that this incident proved further the size of the violations committed by the PA security apparatuses against freedom of the press. The forum expressed its solidarity with the journalist who said he would not respond to any summons for interrogation from any PA security apparatus. Khamis stressed that there is a coordinated war launched by the PA and Israel against the Palestinian journalists, noting that 14 of them are locked up in Israeli jails. He also expressed his dismay at the silence of the Palestinian factions and human rights groups on such violations against the journalists in the West Bank. PA intelligence personnel had kidnapped Khamis on Saturday morning from the medical care hospital in Ramallah city without any arrest warrant. The intelligence interrogators questioned him about his journalistic activities and asked him to attend another session of interrogation later before releasing him at five o'clock in the afternoon. Khamis, who works for Zamn Press agency, had been kidnapped last April as a result of his protest against the arrest of a female journalist named Esmat Abdul-Khalek because of a posting on her facebook page. Two prisoners who escaped from a jail in Gaza last week have turned themselves in to Hamas authorities, Gaza's interior ministry said in a statement Tuesday. Ammar Abu Hein and his brother Bilal turned themselves in to police on Monday, a statement said. Hamas security forces intensified security in the Gaza Strip after the jail break last week, setting up checkpoints on roads leading to smuggling tunnels and distributing photos of the fugitives. Naval security forces in the coastal territory imposed a ban on fishing the day the prisoners escaped, fearing they might try to flee the coastal territory. A third escapee, Mousa al-Deiri, is still on the run. Palestinian Authority security forces arrested four Hamas members in the West Bank on Tuesday, Hamas said in a statement. 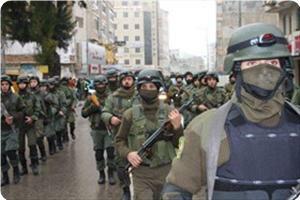 The men were detained in Nablus and Hebron. Minister of the Interior and National Security in Gaza Fathi Hammad confirmed that quite number of spies, who have not surrendered themselves during the recent amnesty, have been arrested. Hamad confirmed the ministry's commitment to its promises to the spies who have secretly surrendered themselves, so that they will contribute in national work. He pointed out that the ministry will release in the coming period a number of spies who have spent two-thirds of their sentences in prison and who showed their intention to offer help to the Palestinian Intelligence services in Gaza. Hammad confirmed that the ministry has overcome the scourge of spying, pointing to the current war of brains against the occupation. The Palestinian interior ministry said it initiated its arrest campaign against Israel's spies in the Gaza Strip after finishing its first campaign which had given the spies a chance to repent officially and be good citizens once again. Senior official of the interior ministry Ibrahim Salah stated in a press release posted on its website that the spies who had not taken advantage of any chance before cannot use any other chance. "The spies have no escape and they will be exposed. The security apparatuses will get them after the period granted to them for repentance had expired, and the informer who missed the opportunity given to him has to bear the consequences of his decision, Salah underlined. "This person has fallen victim to the occupation and we opened the door for him to repent and return to the arms of his people, but if he chose to persist in his collaboration with the occupation, he would destroy his family and society," the official added. He stressed that the security apparatuses in Gaza possess complete files of veteran agents who have been working for the Zionist entity since the seventies and intend not to keep these files secret forever. The official noted the interior ministry conducts arrests against spies based on certainty and not mere suspicion or doubt, hailing the Palestinian citizens and the resistance factions who contributed to the success of the counter-espionage campaigns. A Palestinian authority court in Qalqiliya city circulated a verdict in local newspapers demanding four Palestinian prisoners in Israeli jails to turn themselves in within 10 days to the authorities. The court said in its announcement that the prisoners must stand trial on charges of their affiliation with armed groups from Hamas. 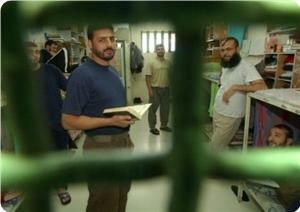 The prisoners in Israeli jails are Ahmed Al-Omer, Malek Quzmar, Harith Asi and Rami Azzun. The families of the prisoners, for their part, expressed their dismay and shock at this attitude and described it as immoral, antinational and a stab in the back of the captive movement. These four prisoners have already been arrested and tortured several times by the PA security apparatuses.